This article describes the Linux booting process in detail, such as the steps involved, which scripts are run, which configuration files are read and their order, since the time of turning on the system till getting the login prompt. 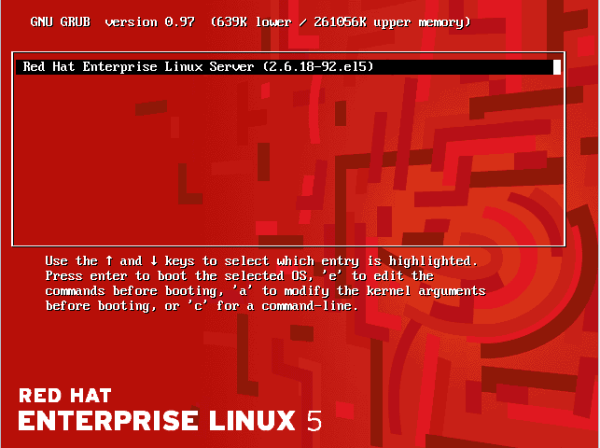 Although this article projects a general view of booting a Linux system, some configuration files and commands can be Hat specific. You can also download linux boot process pdf version for future reference. BIOS or the Basic Input Output System is a firmware program that performs a very basic level of interaction with the hardware. This is the first program that takes control when the computer is switched on. The BIOS performs a test on all the hardware components and peripherals called POST or the “Power On Self Test”. It initializes the required hardware for booting. After POST executes successfully, the BIOS looks for a boot device from a list of devices. Modern BIOS allow you to configure the order of these devices (sometimes called boot preference) that BIOS checks for booting. These boot devices can either be a floppy drive, CDROM, hard drive, a network interface or other removable media (such as USB flash drive). The BIOS checks for the boot sector on the bootable device. Boot sector is the first physical sector on the storage device, and contains the code required for booting the machine. • First 446 bytes contain bootable code. • Next 64 bytes contain partition information for 4 partitions (16x4). That is why the hard disks can have only 4 primary partitions as the MBR can store information for 4 partitions only. So if you need more than 4 partitions on the hard disk, one of the primary partition has to be extended, and out of these extended partitions, logical partitions are created. • The last 2 bytes are for MBR signature, also called magic number. (Thus total of 446 + 64 + 2 = 512 bytes). The first 446 bytes of MBR contains the code that locates the partition to boot from. The rest of the booting process take place from that partition. This partition contains a software program called the 'bootloader' for booting the system. 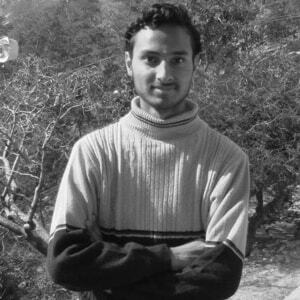 According to gnu.org, "a bootloader is the first software program that runs when a computer starts". 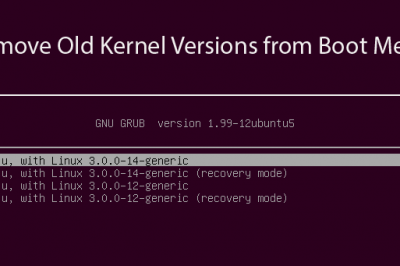 GRUB or GRand Unified Bootloader is the bootloading program for Linux like operating systems. There are two main versions of Grub that are available (Grub version 1 and 2). 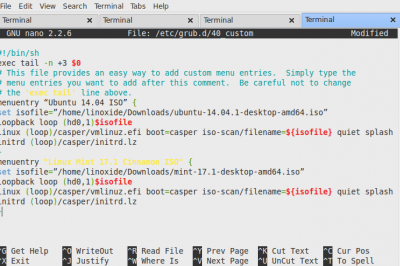 Presently, most Linux distros have started using grub version 2. One main feature of grub is that it can be installed using Linux image and there is no need for running the operating system. Grub is a multi-stage bootloader (Stage1, Stage 1.5 and Stage 2). The 3 stages for grub version 1 and version 2 are explained below. Stage 1 can load Stage 2 directly, but it is normally set up to load Stage 1.5. GRUB Stage 1.5 is located in the first 30 kilobytes of hard disk immediately following the MBR and before the first partition. If this space is not available (Unusual partition table, special disk drivers, GPT or LVM disk), the installation of Stage 1.5 will fail. The stage 1.5 image contains file system drivers. This enables stage 1.5 to directly load stage 2 from any known location in the filesystem, for example from /boot/grub. Stage 2 will then load the default configuration file and any other modules needed. Stage 1.5 -> core.img is by default written to the sectors between the MBR and the first partition, when these sectors are free and available. For legacy reasons, the first partition of a hard disc does not begin at sector 1 (counting begins with 0) but at sector 63 leaving a gap of 63 sectors of empty space, that is not a part of any partition of the file system and therefore, not prone to any problems related with it. Once executed, core.img will load its configuration file and any other modules needed, particularly file system drivers. At the time of installation, it is generated from diskboot.img and configured to load stage 2. Stage 2 -> files belonging to stage 2 are held in the /boot/grub-directory, which is a sub-directory of /boot/ directory. Corresponding to this menu entry, the first command, i.e. "root (hd0,0)" specifies the partition on which a compressed kernel image and initrd file are located. The second command i.e. "kernel /vmlinuz-2.6.18-238.el5 ro root=/dev/VolGroup00/LogVol00" tells which kernel image to use (in this case vmlinuz-2.6.18-238.el5). The arguments to this command are 'ro' and 'root'. 'root' specifies the device on which root directory of the filesystem (i.e. / directory) is located; 'ro' means that this partition is to be mounted in read only mode (i.e. the kernel mounts the root partition in read only mode). Note that the partition for root filesystem and the partition on which this kernel image resides (i.e. boot partition) are different. The third command is the location of initrd. Before going into the details of what initrd is, let's look at a problem caused at the boot time. The Linux kernel does not have these features compiled into it. But they are present as modules. So, the kernel needs to load these modules in order to mount the root filesystem. These modules are present under /lib/modules/ directory, which is present on the root filesystem itself. But this root filesystem is not mounted yet (that is what we have been trying to do so far). So, how can kernel access the modules for mounting a filesystem which are present on the filesystem itself (without mounting it)? The kernel and GRUB provide a solution through initrd, the initial RAM disk. It contains the modules needed to mount the filesystem, and only modules needed for that filesystem are included. GRUB also supports chainloading, the method used to pass control to other bootloader. Chainloading is used by GRUB to boot operating systems like windows. This can be checked in the above configuration file, under the title Windows XP Pro. 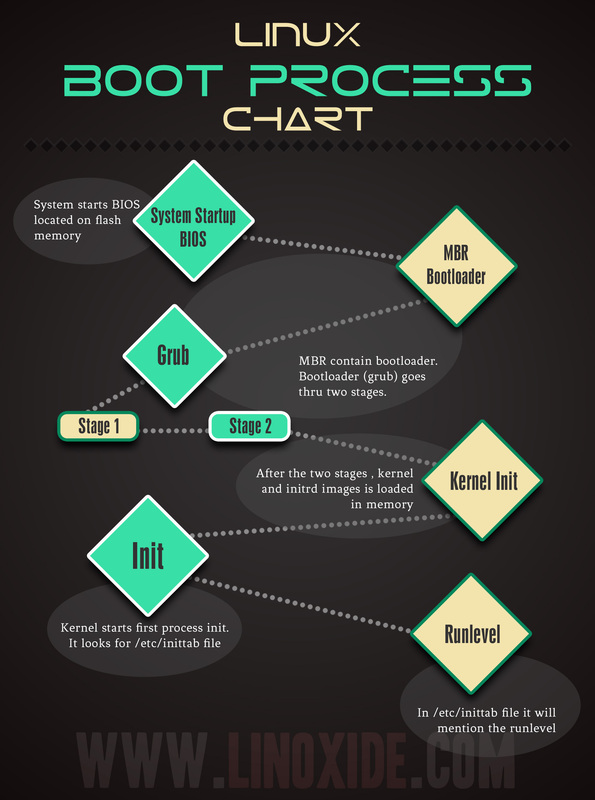 After GRUB stage 2, the location of the kernel and necessary modules through initrd are known. Now the kernel is loaded into memory and initialized. The initrd image is compiled and mounted into the memory. It serves as a temporary root file system and helps kernel to boot properly without mounting any root file system. Now that all the drivers are loaded into memory, and kernel has booted, kernel mounts the root filesystem in read only mode, and starts the first process. The ‘init’ is the first process started by kernel (initialization process). It is the parent of all processes. The PID (Process ID) of init process is always 1. This process persists till the computer halts. It is responsible for the whole state of system. The settings for this process are stored in its configuration file, /etc/inittab (system initialization table). Before diving deeper into the details of this file and proceeding any further with the boot process, let’s discuss runlevels. Summarizing runlevels: Runlevel 1 is used for maintenance purpose, because this is a very limited runlevel. Only the minimum scripts run in this runlevel. Only root user can log in. No other user can log into this runlevel. Runlevel 2 is more relaxed than runlevel 1. Here, all the users can login, but networking service is not running. Runlevel 3 provides a full working environment. All users can log in, networking is enabled. Runlevel 4 is for experiment purpose only. In runlevel 5, graphical console is available. Runlevel '0' is the halt state of system, and switching to runlevel 6 will reboot the system. Now that we are clear about runlevels, let's continue our discussion about init process and its configuration file, 'inittab'. "id" is the unique sequence of characters for identifying an entry in this file. "runlevels" are the runlevels for which that entry is applicable. "action" is the action that is to be taken for the runlevel. "process" specifies the process that is to be executed. This line tells init process to execute "/etc/rc.d/rc.sysinit" script. This is the first script executed by init during booting process. • It checks and mounts filesystems (/proc, /sys, and others in /etc/fstab). • And the root filesystem, which was mounted read-only earlier (as specified in GRUB configuration file), is checked and remounted read-write. There are directories corresponding to each runlevel under "/etc/rc.d" directory. According to this line, the scripts in /etc/rc.d/rc3.d directory are run. Let’s list the files in this directory. (Other directories like rc1.d, rc2.d ... have similar files in them). Some files in this directory start with 'S' and others with 'K'. The files starting with 'S' correspond to the scripts that have to be 'started' in that particular runlevel, and the ones with 'K' correspond to the ones that are to be 'killed'. These files are just soft links to scripts under "/etc/rc.d/init/d" directory (One soft link points to "/etc/rc.local" which itself is a soft link to "/etc/rc.d/rc/local"). The scripts in "/etc/rc.d/init.d/" are daemons. Daemons are the processes that run in the background and provide some kind of service. For instance, http daemon (httpd) provides web service. The "/etc/rc.local" script runs after all these scripts have been executed. If there is a command or script that you want to be executed at system startup, you can put it in this script. Now that all these scripts have been executed successfully, login prompt appears. 1.Hardware Power Up , CPU gets into real mode and jumps to fixed location 0xFFFF0 i.e., hardwired in the CPU circuit. 3.BIOS code will select the boot device (hard disk , CD ROM , Floppy , USB etc ) that we have configured. 4.Once BIOS undestands the boot device , BIOS code will load the MBR to RAM. grub-install is the program that write data into MBR. 7.The executed core.img code now initialises all the modules that are built into it (linked into core.img); one of these modules will be a filesystem driver capable of reading the filesystem on which directory /boot/grub lives. 8.You can link config file into core.img if you need booting through pxe , remote nfs etc. In normal cases, it is not required. 9.Core.img now loads file /boot/grub/normal.mod dynamically from disk , this module provides an interactive command-line. 10.Grub will load a file /boot/grub/grub.cfg which is a shell script and it will then configure the standard Grub boot menu. Thanks for reading and please provide your suggestions on the below comment section. wow hats off great info nicly explained and good heart to share. What is the use of multiboot.h file? When grub use this file?